According to a new market research report published by Credence Research “Oil & Gas Analytics Software Market (Operations – Upstream (Exploration and Drilling Analytics, Production Planning & Forecasting Analytics, Field Surveillance and Monitoring Analytics, Equipment Maintenance Management Analytics, Workforce Management Analytics and Asset Performance Analytics), Midstream (Fleet Analytics, Pipeline SCADA Analytics and Storage Optimization Analytics), Downstream (Pricing Analytics, Commodity Trading Analytics, Refining Analytics and Demand Forecasting Analytics); Deployment Type – On-premise and Hosted) – Growth, Future Prospects and Competitive Analysis, 2018 – 2026”, the global oil & gas analytics software market was valued at US$ 2.34 Bn in 2017 and will be growing at a CAGR of 17.5% during the forecast period from 2018 to 2026. 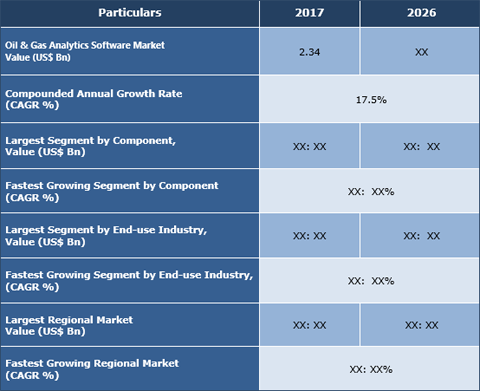 The oil & gas analytics software market expected to grow at a compounded annual growth rate (CAGR) of 17.5% during the forecast period from 2018 to 2026. The size of the market stood at stood at US$ 2.34 Bn in 2017. Increasing focus on the part of oil & gas companies to focus on data analytics in order to generate growth is one of the most prominent factors aiding the oil & gas analytics software market growth. In recent years, a growing number of oil & gas companies are implementing analytics with an aim to increase revenue. The advent of big data has further complimented the oil & gas analytics software market growth. Oil & gas companies generate a humungous amount of data and over the years with improvements in the process of data collection, has enabled these companies to efficiently utilize data and improve the business processes. The fact that implementation of data analytics helps oil & gas companies to reduce costs is further bolstering its adoption in companies. Moreover, with real-time analytics gaining in prominence and data continuing to offers significant growth opportunities, the oil & gas analytics software market expected to witness significant growth during the forecast period. However, data privacy and ownership concerns remain major market growth inhibitors. Further, the need for companies to comply with legal and regulatory regulations expected to be another major challenge influencing the market growth negatively. North America stood as the largest market for oil & gas analytics software in 2017 and expected to remain a lucrative market for investment during the forecast period from 2018 to 2026. The region held a share of more than 35% of the overall market value. Increasing exploration and production activities in the region has been an important factor contributing to the oil & gas analytics software market growth in North America. In recent years, exploration and production of unconventional oil and shale gas in the region has been on the high, a factor positively influencing the oil & gas analytics software market growth. Some of the major players operating in the oil & gas analytics software market include Hitachi, Hewlett-Packard, IBM, Oracle, Northwest Analytics, SAS Institute, SAP AG, Tibco Software, Teradata and Cisco Systems among others. What was the global oil & gas analytics software market size in 2017 and forecast for 2026? What are the current trends in the oil & gas analytics software market? What are the various valuable opportunities for the players in the market? Which is the largest regional market for oil & gas analytics software? Which region expected to be the fastest growing and why? What are the future prospects for the oil & gas analytics software market? What are the major drivers and restraints influencing the market growth? What are the key strategies adopted by the leading players in market?